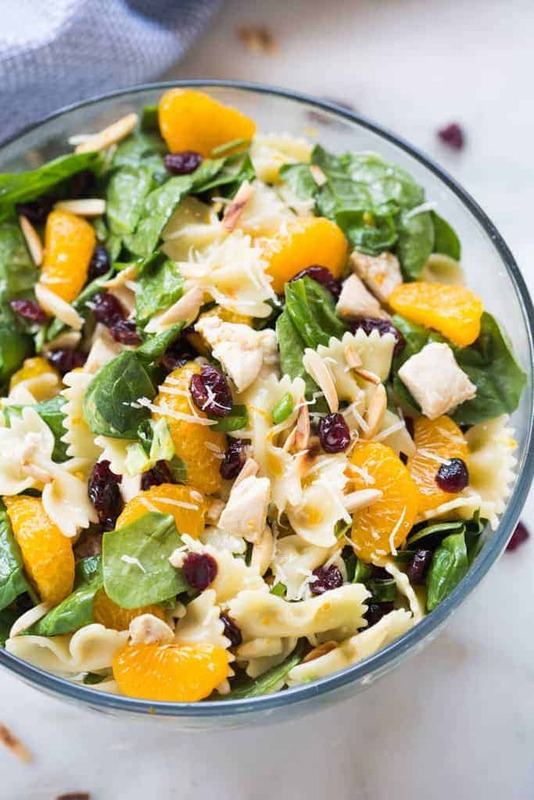 Healthy Chicken Pasta Salad loaded with spinach, mandarin oranges, craisins, almonds and parmesan cheese, tossed together with a light and healthy creamy citrus dressing. I’m trying to be better at making meal plans for the week, but it’s hard during the summer months when our schedule is so much more relaxed. We play hard, and I often forget to make a dinner plan. We’ve been going to the pool a LOT. My two littles are becoming awesome little swimmers, thanks to our favorite puddle jumpers. They want to jump off the diving board again, and again and again, which means lots of treading water for me! Baby also loves to be in the water with us–but that’s to be expected when it’s 110 degrees outside, right?! By the time dinner time comes around I’m panicking for something quick, easy and healthy. Also something that my kids wont complain about eating 🙂 . 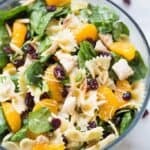 Usually I throw together a simple wrap for dinner, or a fresh pasta salad, like this Healthy Chicken Pasta Salad. It’s “hearty” and filling from the noodles and chicken, and the dressing is awesome. It’s a creamy citrus dressing that’s totally healthy and delicious. This one is always a winner with my family, and I love how quickly it comes together. Make the dressing by combining all ingredients and whisking until smooth. You could use a blender to get it really smooth. Refrigerate until ready to use. Cook the pasta according to package directions. Drain and rinse with cold water. Place the cooled, drained pasta in a large bowl. Add 1/4 cup of the dressing to the pasta and toss to combine. 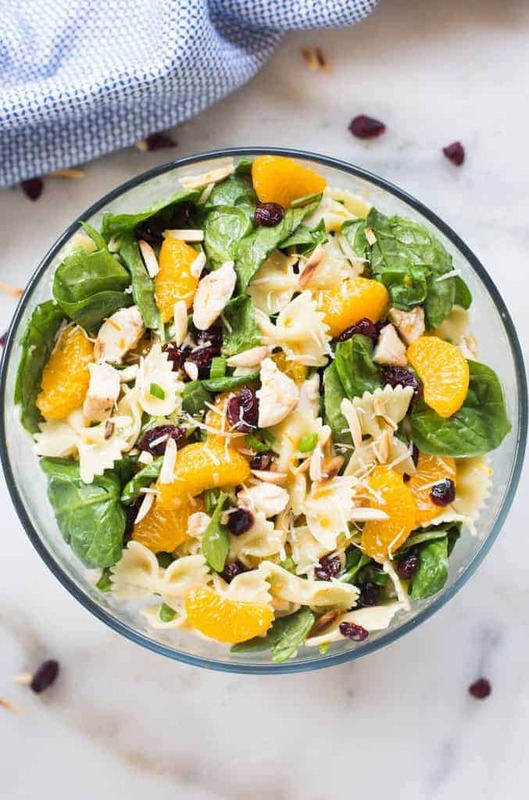 Add in the chicken, spinach, mandarin oranges, craisins, green onion, parmesan cheese and toasted almonds. Drizzle dressing over the top (to taste, you may not want to use it all), and toss everything to combine. Serve immediately. This post contains affiliate links. I love sharing my favorite products and cooking tools with you guys! This looks so good! perfect summertime lunch idea. Will try this soon! This made for a pleasant meal.